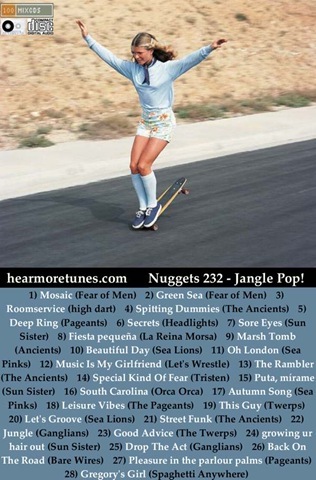 Nuggets 232 – Jangle Pop! More old school skateboarding here. It’s all about The Clean. Fear of Men are from Brighton and the foursome includes at least one guy, so go figure. Their sparkling jangle pop fits nicely into this mix. 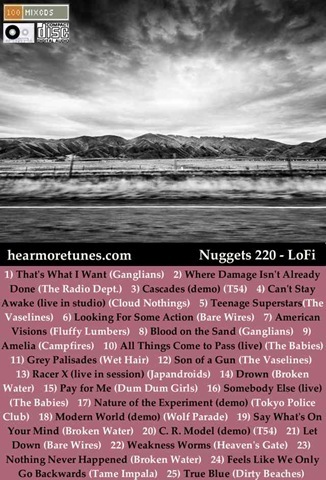 I featured another of their tracks, Doldrums, in a earlier mix (watch vid here). They are working towards releasing an EP. Visit their bandcamp page for more, including a Pink Frost cover. I had to go to ITunes to get this track. Not my favourite music store… More [insert girl group with wall of sound sound here] than The Clean. Hi Dart is a nameless singer from Berlin who is working hard not to be famous while making valium pop… More Nico than The Clean. The Ancients are from Melbourne and the first track is from a double single they put out with fellow Melbourne-ites, the Twerps. The other tracks featured are from their 2010 album, The Ancients 2. Its excellent, buy it from them on bandcamp. The band is still gigging but it looks like half the original members have moved on. Not to be confused with these guys. More The Clean than The Clean. Bare Wires burned brightly, and then crashed and burned at SXSW 2012. Sadly, I didn’t get to see them flame out in Austin, but what they have left behind is pretty good. Their posthumous album is up on Itunes. More Ramones than The Clean. The impetus for the breakup, according to Melton, was a rough week in Austin following a southern tour across the U.S. On the first night of South By Southwest, Melton says, drummer Omar Hernandez suffered what Melton called a "self-induced health-related concern" that made him unable to perform with the band. I did track down The Twerps at SXSW 2012. They played a gig in a very dark room out back of a bar. The Twerps are playing Laneway in Melbourne next year, no word yet whether they will cross the ditch to play in Auckland. Come on over guys! 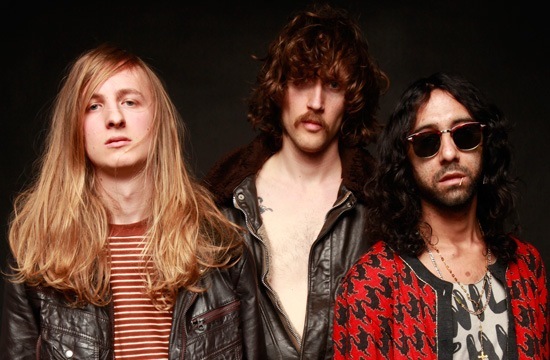 Sun Sister are from Fitchburg, Massachusetts. and feature here tracks from their 2012 album Rich American Kidz. Get their tape and the MP3’s here. I found them because they cover tracks by Hi Dart, or perhaps it the other way around. Kind of Best Coast’ish with hazy vocals and a surf rock sound. Pageants feature here, again, both of them. There’s a demo from the US duo formed in 2011 and based in Long Beach, California, and tracks off the debut album – Dark Before Blonde Dawn – from the Aussie sandle-gazers of the same name. I brought the tracks through emusic.com, you may find it easier to get it from their label – Sensory Projects. More Pavement than The Clean, worth a listen. Sea Lions, Ganglians, Tristen, Let’s Wrestle and Spaghetti Anywhere have already been mentioned in earlier posts. All have The Clean moments.